Mommy Maestra: Doodle 4 Google Deadline Coming Up! Is your student an artista? Then here is another (last-minute) contest for you! 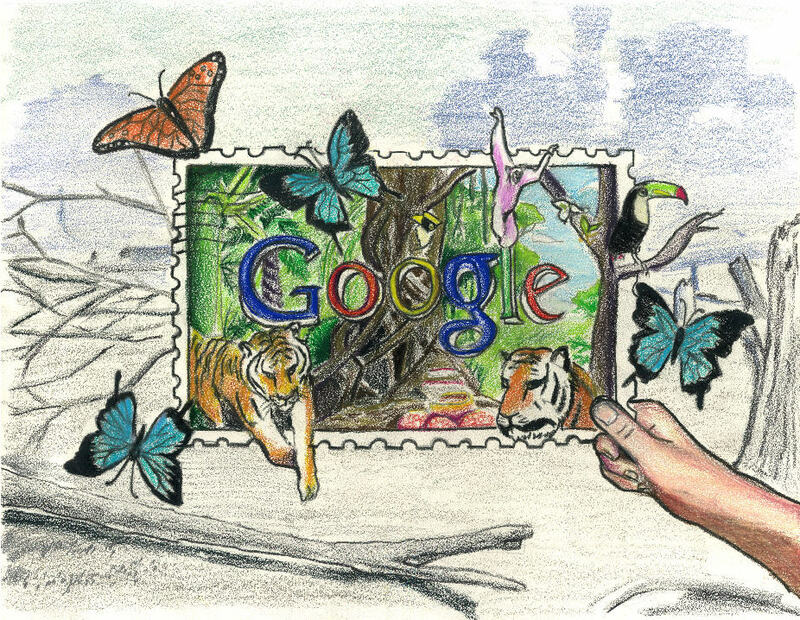 The fourth annual Doodle 4 Google contest is taking place. But you'll have to hurry, because the deadline to REGISTER is 11:59:59 p.m. Pacific Time (PT) on March 2, 2011. Don't worry, though - your child/student has two weeks to work on their entry (only one per child). All entries must be postmarked by March 16th, 2011. The contest is open to U.S. students in K-12 - including homeschoolers. This year, parents or guardians can register their students directly, and if a school registers, there’s no limit on the number of doodles they can submit. The Boys & Girls Clubs of America and the Girls Scouts of the USA are also invited to participate. Last year's winner in the Grades 4-6 category was Raymundo Marquez, Grade 6, from Nellie Mae Glass Elementary in Eagle Pass, Texas. (His winning entry is pictured above.) To see the other winners, click here. This year's theme is “What I’d like to do someday...” - the creative possibilities are endless! If your child is interested in participating, then go here and register your child. Afterwards, you can download the Google templates, break out the crayons/markers/paint/etc., and then let your kid's creativity loose! The National Winner will be awarded a $15,000 college scholarship to be used at the school of his or her choice, a trip to the Google New York office for an event on May 19, 2011, a laptop computer, a Wacom digital design tablet, and a t-shirt printed with his or her doodle on it. We'll also award the winner's school or After School Program a $25,000 technology grant towards the establishment or improvement of a computer lab or technology programming. The National Winner will also have his or her doodle featured on the U.S. Google.com homepage. Ay, chihuahua!! The panel of famous judges will also select three (3) National Finalists, forty (40) Regional Finalists, and four hundred (400) State Finalists. For a complete list of prizes, go here. For more details about the contest, visit the Doodle 4 Google site.